This Venezuelan was one of the colourful characters in the Grand Prix paddock during the early 1980s at a time when the sport was maturing but retained a sense of fun thanks to the antics and attitudes of men like Lavado, Sheene, Nieto and Lucchinelli. 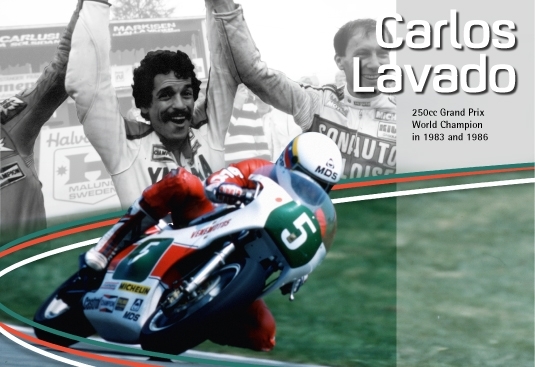 It was the 350cc world championship win by another Yamaha star, Johnny Cecotto, – the first Venezuelan triumphant in Grand Prix – that spurred Lavado in his road racing ambitions. The young man from Caracas made an instant impression on his debut at the highest level as he took a TZ250 to 2nd place at his home Grand Prix in 1978. He won the 350cc class the following year at the age of 23 and in 1980 was a permanent member of the category. Lavado was a hard and fast racer who gave absolutely everything on the track; the result of which could mean a trip in the victory car or a slide down the road. He came into the Yamaha Factory Team in 1981 and would not drop out of the top five of either the 250cc or 350cc divisions for the next seven seasons, earning two world championships in the quarter-litre series in 1983 and 1986 (in that distinctive yellow-red-white ‘HB’ livery). Lavado accumulated 19 victories but perhaps none was more impressive than his last, in 1987, as he fought back from the rear of the 250cc field in typical and emphatic fashion in Yugoslavia. By that year the champion was using the fierce new YZR250 V-twin. Lavado won many fans for his passion on and off the track. His final year with Yamaha was in 1988 and although he retired in 1992 he still zips up the leathers for outings on the TZ250 with the Yamaha Classic Racing Team. In 2010 he made a welcome return to the MotoGP paddock as adviser to Moto2 rider and countryman Robertino Pietri.